Social Trust is very important for a business to be successful online. 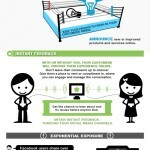 Friendize.me came up with a remarkable infographic which gives us a valuable insight into social trust. An astonishing 33% of the mob said, that they frequently ask their friends or family before buying new products and services. 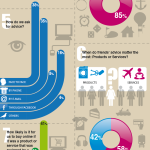 About 32% said that they tend to ask advice for products while a remarkable 68% ask for advice on services. It was also important to note that 48% of the people surveyed, highly values their friends and family’s opinion and more interestingly, about 85% of them said that they rather listen to a friend than to an expert that they never met before. A whooping 71% would buy online if the product or service is reviewed by a friend! According to Friendize, about 38% wanted to ask advice face to face rather than through any social networking sites. About 34% of the people wanted some advice on electronics and household appliances, 31% on health and beauty, 25% on cars and transportation, 19% on food and drinks, 11% on medical and personal care, 9% on travel and 8% on outdoors and sports. And lastly, an incredible 65% of these people would likely or very likely to use an online service by getting advice from trusted people. Now you know how important Social Trust is to your businesses! The Power of Social Trust Overall rating: 5 out of 5 based on 27 reviews.